British actress Zena Moyra Marshall was born on New Year's day in 1925 in Nairobi, Kenya. Her exotic looks landed her several small parts in film and television, often being cast in ethnic roles, such as Italians and Asian characters. Notable films for the 5' 5" actress included "Good Time Girl", "The Lost People", "Helter Skelter", "So Long At The Fair", "Morning Departure", 'Three Cases Of Murder", and "Crosstrap". Above: Zena Marshall as Miss Taro in "Dr No". Marshall shot to fame in the role of Chinese SPECTRE agent Miss Taro in the debut James Bond film "Dr No" in October 1962. 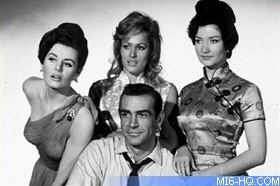 Although it took a couple of years for worldwide audiences to catch on to the 007 phenomenon (the film was not released in the USA until May 1963), and thanks to re-releases of the early films when Bondmania struck with "Goldfinger" and "Thunderball", Marshall's scenes with Sean Connery became part of cinema history. Although not the first conquest for Bond, Miss Taro was the first 'bad girl' of the series. 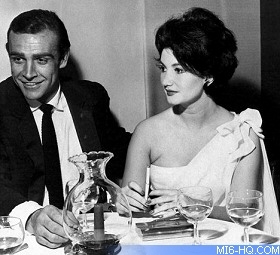 In the pay of the villainous Dr No, Miss Taro arranges to meet Bond at her apartment in the mountains for a date. En route, Bond is menaced by the assassins who pursue him in a hearse. Bond escapes under a crane parked in the road as the pursuing hearse plummets over a cliff and explodes. Taro is startled to find Bond on her doorstep and later takes a call from someone who wants her to keep him there for a couple of hours. Bond, naturally, finds the perfect way to kill the time then sets Taro up to be arrested by the local police superintendent. Marshall was married to Ivan Foxwell in 1991 until his death on 16th January 2002. In recent years, she proved extremely popular at Bond reunion events and screenings. After suffering a short illness, Zena Marshall passed away on Friday 10th July 2009 at the age of 84. Above: Zena Marshall (pictured left of Sir Roger Moore) joins a Bond Girls reunion on stage at the Ian Fleming Centenary event held in London last year.